Truffles used to be one of those desserts that I was scared to try to make-they always seemed too “fancy” for me. I would see recipes telling me to use candy thermometers and seemed to need an inordinate amount of attention. So I never tried them. My husband actually told me these might be his favorite dessert I’ve ever made-can you believe that? Of all the amazing treats I post on the blog these might just be his very favorite. And they were easy!! Like probably 15 minutes of total work-that easy! 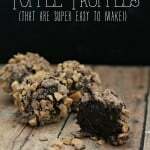 These super easy dark chocolate toffee truffles are deceptively simple to make and incredibly indulgetn! In a small saucepan combine DOVE® dark chocolates with whipping cream. Heat on medium heat, stirring constantly for 2 minutes or until fully melted. Remove from heat and add vanilla. Stir to blend. Pour mixture into a bowl and refrigerate 2.5-3 hours or until thick. Pous toffee bits into a second bowl. 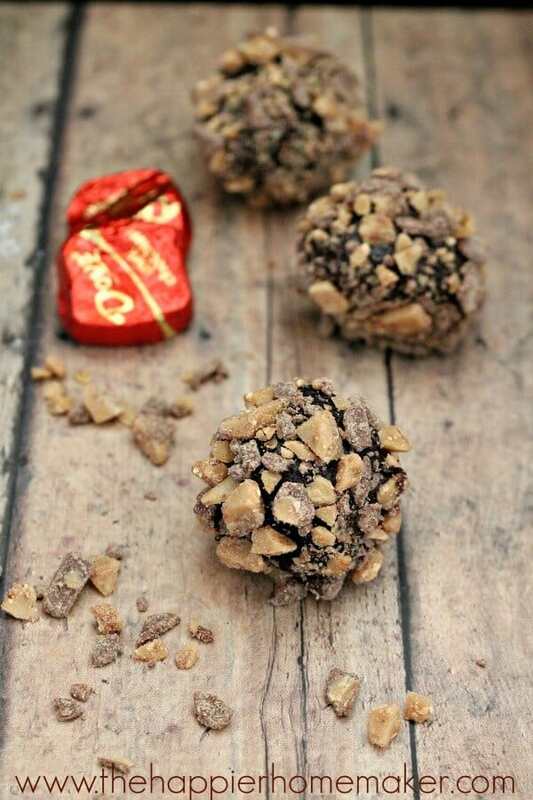 Roll chocolate mixture into 1″ balls between using the palms of your hands and rolls in toffee bits to cover. Place on parchment paper lines baking sheet and refrigerate if desired until ready to eat! I hope, hope, hope you try these soon. The key is to make them with super high quality chocolate-I always use DOVE® Silky Smooth Dark Chocolate Promises (just like with my S’mores Bars and Dark Chocolate Cake Pops!) You can find DOVE® online, on Facebook, and on Twitter. Those look amazing! I want some right now! 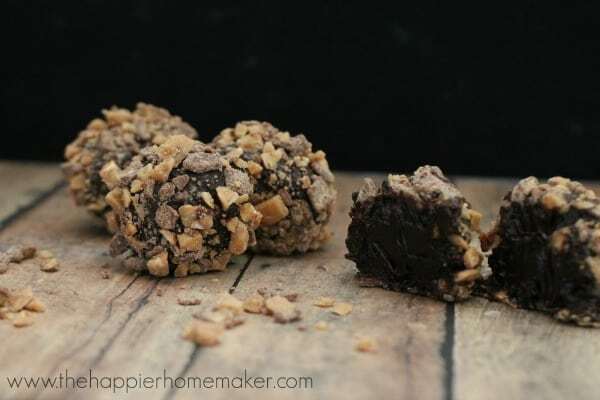 LOVE the addition of toffee to these truffles, Melissa! I had no idea it would be this easy to make truffles – they would make a great holiday gift for friends & family! 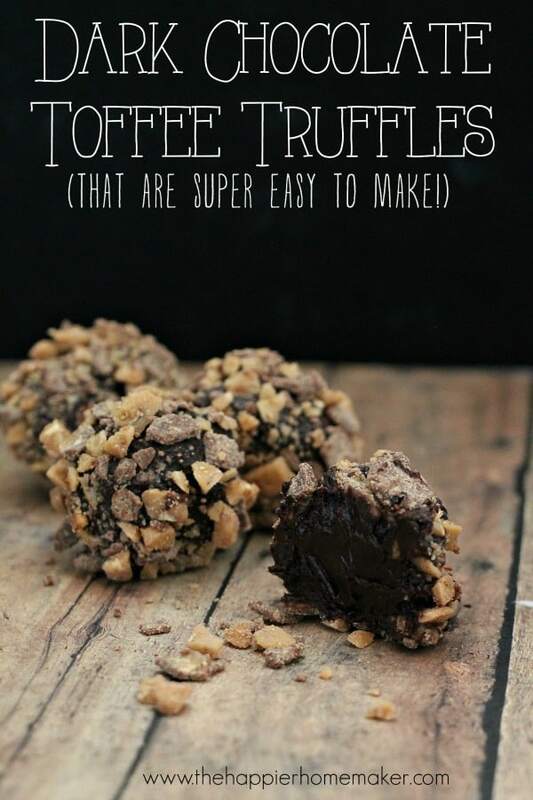 Easiest and most delicious looking truffles EVER!! OMG yum! These look absolutely amazing!!!! They were awesome Gwen-but I was surprised how much my husband loved them, he’s not usually the chocolate fiend of the family! Thanks Stacy-they were seriously so easy and sooooo good! Have a great day! Oh man! I bet these are super tasty! They are Sharon-maybe a little too tasty! Dark Chocolate and Toffee?! Sign me up! Definitely going to make these tomorrow — have the Dove chocolates all ready!! I have a question, the chocolate doesn’t get too set by putting in the fridge for that long?? I was afraid they would be too hard to roll in a ball. But I’m going to try it!! I had no problem at all Donna-I tried them for less time in the fridge and they were too sticky to roll. Does this actually only make 12, or is a serving 2 truffles? It only makes 12 truffles but you can easily double or triple the recipe Amy-I only make small batches because they are so addictive! !